The mophead hydrangea (Hydrangea Macrophylla) can outgrow a space in a few years if left to its own devices. 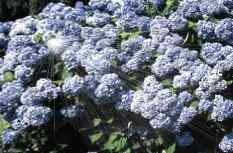 However, many people are concerned that care and maintenance of hydrangeas is something they might mess up, ruining the bush. The truth is that these plants are very simple to keep in good order. Caring for hydrangeas is all about pruning at the right time. To keep your hydrangea in peak condition, remove about one third of the oldest stems every year in mid spring. Cut them out as close to ground level as you can and the hydrangea bush will produce lots of new flowering growth at the bottom. If you want to cut out healthy growing stems, do this just above a new bud pair. All you need to do is repeat this annually for guaranteed healthy hydrangeas. Famously, you can change the colours of the flowers by altering the pH levels in the soil. You can drop the pH down and turn the flowers blue by adding some soil sulfur (available from a garden centre). Alternatively, turn the flowers pink by adding some agricultural limestone to raise the pH. changing the colour of your hydrangea works best with potted specimens but you should have success in open ground too. White mophead hydrangeas are unlikely to change colour whatever you add to the soil.